I attended the Career Empowerment Summit in October. It was sponsored by Career Directors International, the top professional association for career coaches. For the first time, I presented to my colleagues from all over the country, which was simultaneously exciting and terrifying. My session was called “Avoiding Burnout with Resiliency Strategies for Your Clients and You!” Here are four important takeaways from the sessions I attended. LinkedIn is still the leading professional career development and job search tool in the social media arena. Many individuals are also using Facebook, Twitter, Google+ and Pinterest, but research shows it’s better to learn and use one social media site really well than to split your time between several. A recent study by the Society for Human Resource Management found that 77% of employers are using social networks to recruit. Among the recruiters using social media tools, 94% said they use LinkedIn. I recently became certified as a LinkedIn Social Media analyst so I can offer support to my clients on best practices. I discovered several interesting features on LinkedIn that many people don’t use. For example, when you click on “Who’s Viewed Your Profile,” you can see not only who clicked on your profile, but also how many times you appeared in a LinkedIn search. You can see professions of the people looking at your profile and how you rank for profile views. You can also see the cities where your viewers live and any companies that are viewing you. Being proactive on LinkedIn is vital to being proactive in your career. You should spend time every week adding to or updating your profile and becoming more comfortable with the features on LinkedIn. What kind of work feels meaningful and challenging? What outcomes does my present or next employer seek? How can I make something of the overlap? The most important questions he asked were, “What makes work feel like it isn’t work? What is the outcome? What does it feel like?” Take time over the next few weeks to answer these questions. It’s better to answer them when we’re not under pressure and can take the time to be proactive about career development. Stay up to speed. Do everything you can to keep up with technology and changes in your field. Research the skills or certifications required for your present or new venture. Understand the importance of being visible online. If a Google search on your name only turns up information about other people, you’re at risk of looking out-of-date and being a victim of mistaken online identity. Get fit. Be physically fit and look and dress with an eye toward a vibrant appearance. People do judge a book by its cover, and this instantly demonstrates that you’re up for the job and have the necessary stamina. Understand that technology has made the job search tougher. The widespread use of job boards and employer career centers has increased competition for jobs. HR folks receive an average of 250 application for every job they post. Networking is not optional! Leverage your “alumni” options to boost your chances of finding a position. Join LinkedIn groups to become more visible and accessible to recruiters. Groups also allow members to contact each other without being “connected,” which is appealing to recruiters. There are even groups for job seekers that provide great visibility with recruiters. Don’t forget the mice. 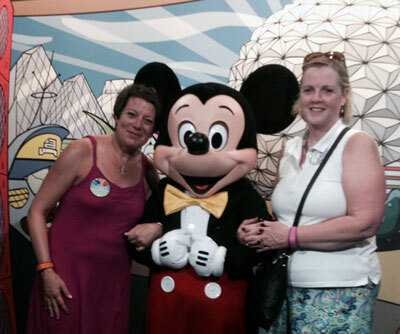 A visit to Orlando is not complete without a reunion with Mickey and Minnie Mouse. I discovered I still find complete happiness from being with them at Disney World. I helped celebrate my dear friend Pam’s 50th birthday by spending half a day in the Magic Kingdom and the rest of the day and evening in Epcot, taking in the Wine and Food Festival. We had such a blast, and I was reminded how important it is to squeeze in as much fun as you can at work conferences. Life is short, so make sure to schedule fun in between your never ending to-dos. This time of year, it’s important to remind ourselves of all the things we are thankful for, even in the midst of a job search or dealing with the various frustrations life throws at us. I am grateful to be able to help spark my clients’ success and thankful that so many clients come from direct referrals from past clients. Thank you for your support and a very Happy Holidays to you and your family.